According to the theory of superstrings, the fundamental constituents of the material world are not point-like elementary particles, but tiny one-dimensional strings having a length of about 10-33 cm (the Planck length). Like the string of a violin, they can vibrate in many different ways (different modes), which correspond to the different elementary particles observed in nature. It is a quantum theory that incorporates gravity naturally. 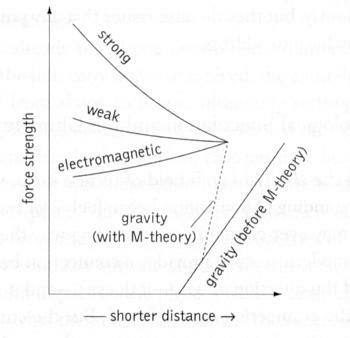 In its larger framework of M-theory, the strengths of all the four fundamental forces merge together at very small distance (~10-33 cm.) as shown in Figure 15-13. Figure 15-14(a) and(b)). Figure 15-14(c) shows a point particle splits into two. Since the vertex is a point, there are many possible forms of interaction, all of which are invariant under the Lorentz transformation. However, when a string splits into two as shown in Figure 15-14(d), there is no well-defined notion of when and where this happened. For example, the string splits at point o in the rest frame, in inertial frame 1, the splitting occurred at the point indicated with the solid dot, and for inertial frame 2, it is at the point indicated with the cross. As a result there is only one choice for the interaction. All the other inertial frames have to follow the same rule. When supersymmetry is incorporated into the original string theory, it resolves the problem with tachyon (square of mass is negative), accommodates the ferminonic vibrational pattern, and merge general relativity with quantum mechanics. 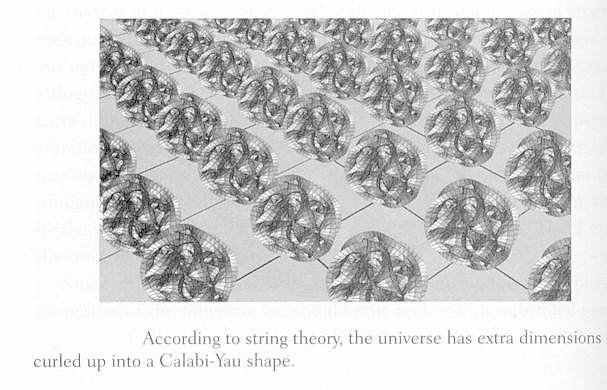 The Theory of Strings becomes the Theory of Superstrings. 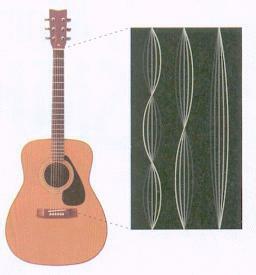 The "heterotic" superstring theory is a theory of closed strings. In contrast to open strings with gauge charges at the endpoints, here the gauge charges are "smeared" over the entire heterotic string. Vibrations (waves) can travel around any closed string in two directions, but the unusual feature of the heterotic string is that the waves moving in each direction are completely different. The clockwise moving waves are the waves of the 10-dimensional superstring, whereas the waves moving anticlockwise are those of the original 26-dimensional bosonic string. To obtain a consistent 10 dimensional theory, 16 of the extra dimensions are interpreted as internal degrees of freedom, which are found to be related to local gauge symmetry. 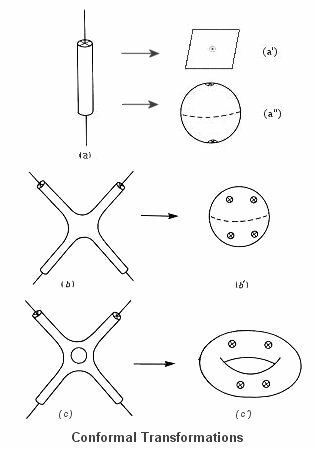 (see Figure 15-15.) its value is now the angle in the circle. Because the radius of the circle is so small (~10-33 cm), the value of the angle is completely unobservable. Consequently, the laws of physics should be invariant under shifts in the angle. This behaviour is reminiscent of the internal rotation mentioned earlier in the U(1) symmetry and they can be identified with each others. Therefore, distortion of this curled-up dimension corresponds to the presence of spin-1 gauge bosons. Actually the compactification is on a six-dimensional space, the theory of superstring severely restrict the geometrical form. 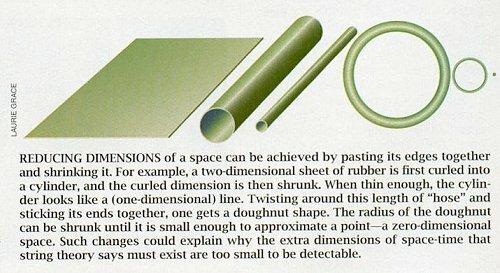 It has been shown that a particular class of six-dimensional geometrical shapes called Calabi-Yau spaces can meet these conditions. Figure 15-16 shows the ordinary space (in two-dimension) with the curled-up Calabi-Yau space at each point. It is drawn only on the intersecting grid lines for visual clarity. diagrams for point particle can now be represented by just one closed-string diagram of the same topology. String theory is invariant under conformal transformations (Figure 15-18b). Such change in topology makes it feasible to evaluate string diagrams. Among other things this makes it possible to compactify the world sheet, closing off the holes corresponding to incoming and outgoing strings. For example, a world sheet with one incoming and one outgoing string (as in (a) of Figure 15-18b) can be conformally mapped to the plane of (a') with the incoming string appearing at the origin and the outgoing string at infinity (not shown) or to the sphere of (a") with the incoming and outgoing strings appearing at the south and north poles. The external string states in (b) of Figure 15-18b with four awkward legs are projected to points as indicated in (b'). It has been mentioned in Topic-12 that the transition from classical to quantum field is via the sum over all possible paths in evaluating the Action. In superstrings, there are two parameters along the worldsheet (in the integral defining the Action) and the sum is over all possible connected surfaces. 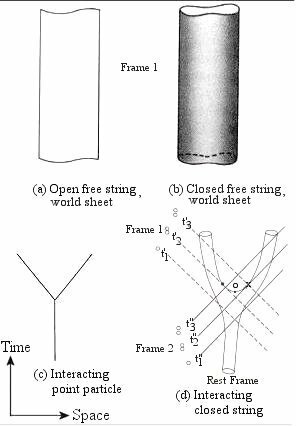 In particular, it includes all the surfaces formed by stretching, pulling, twisting and otherwise deforming (without tearing) the classical world-sheet. So included in the sum are surfaces with very long, thin tentacles as shown in Figure 15-18c. 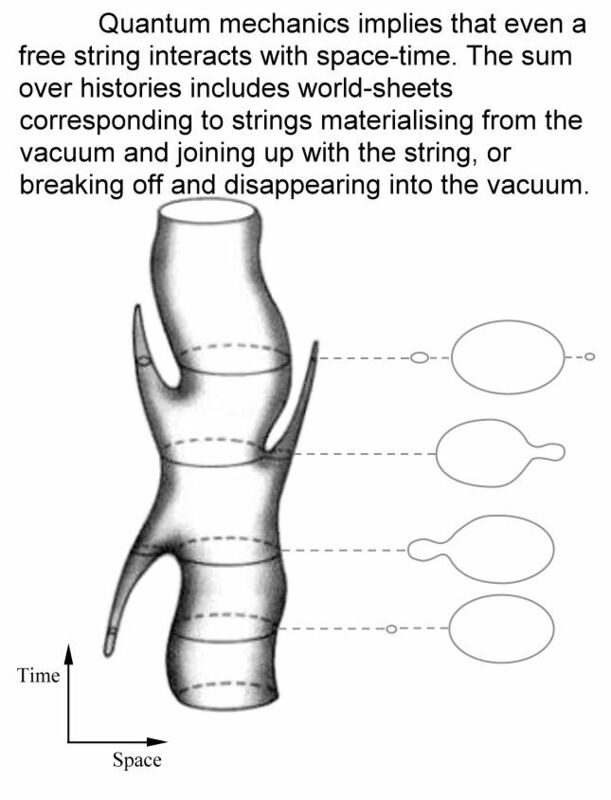 These tentacles can be interpreted as very small closed strings that appear from out the vacuum and join on the the original string, or as closed strings which break off from the original and then disappear into the vacuum. quantum field theories. Perturbation theory is used to expand the interaction into a sum of individual diagrams as shown in Figure 15-19. The first one is the main part called tree-level diagram. The others with increasing number of holes are called loop diagrams, they are contributions from virtual particle pairs. If the interaction strength is small, the series would converge rapidly, otherwise calculation becomes increasingly difficult as the number of loops grows. According to the differences in the number of supersymmetry, gauge groups, kinds of strings or branes, etc. 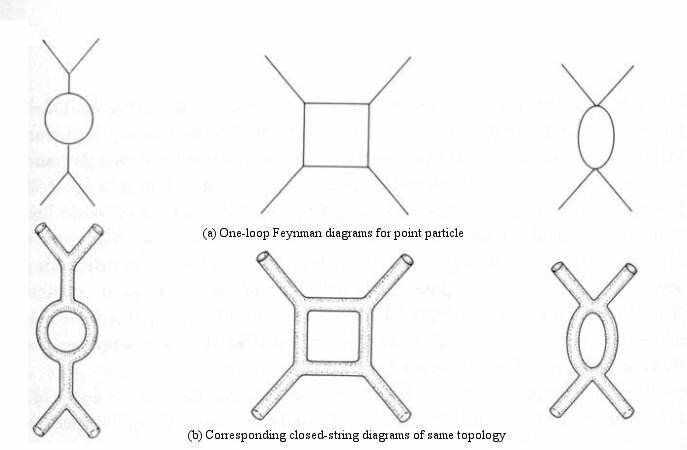 there are five different versions of superstrings theories as shown in Figure 15-20. They are connected by the S-duality, which relates the strong coupling limit of one theory to the weak coupling limit of another theory; and the T-duality, which relates a theory which is compactified on a circle with radius R, to another theory compactified on a circle with radius 1/R. These 10-dimension theories are ultimately linked to the 11-dimension M theory. 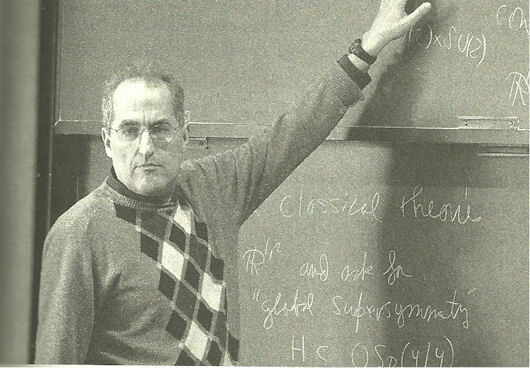 In 1995, Edward Witten gave evidence for a new, profound kind of duality. He suggested that the five theories, although apparently different in their basic construction, are all just different ways of describing the same underlying physics. 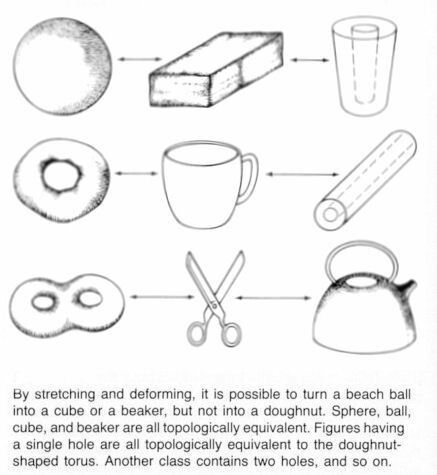 The five theories are just five different windows onto this single theoretical framework (in 11-dimensions), which is now called the M-Theory. M-theory contains extended objects of a whole slew of different spatial dimensions called p-brane (an object with p space dimensions, up to nine). It seems the fundamental ingredients in the M-theory are "branes" of a variety of dimensions. The objects in the five theories show up only as strings (or membranes curled up to look like strings), which are light enough to make contact with physics as we know it. The perturbative analyses are not refined enough to discover even the existence of the super-massive extended objects of other dimensions; strings dominated the analyses and the theories was given the name of "string theories". Currently there is no testable predictions from superstrings. However, it can be shown that at energies below 1016 Gev, the heterotic string theory effectively leads to an ordinary grand unified theory. Meanwhile at this moment, superstrings is the only viable theory that can unify the four interactions (See Figure 15-04a), and have the potential to provide explanations for all the fundamental phenomena. It could take the place at the end of the long journey toward the ultimate theory as depicted in Figure 15-05a and 15-05b. Further details on this subject can be found in the Special Topic on "Superstring Theory, and Calabi-Yau Manifold".